Sorry to go back to my icky laptop's cam pictures, but I wanted to share what has finally come in from the trunk of Sam's car, and my batteries are dead in my camera. This was given to me when I was a weee girl and I kept it in my bedroom as decoration. When my parents moved to North Carolina it was put in my grandmother's attic and almost completely forgotten! Until, I was reminded of its existance earlier this year, and went over early on Christmas day to get it down from the attic. Its missing quite a few bits, but for the most part I think its salvageable. Also, last week I signed up for a shawl KAL (I am insane) and I got the yarn for it yesterday and wound it up. Tripsie says YAY! Yarn, AND A bag I can lick!!! Kitty says "That chick is WEIRD"
It's cute. Just like you. Since Sam brought that into the house, I think you should thank him and knit him something special. It's so nice to see you finding this part of yourself and adding to it. Wow!! That is just gorgeous!! Can't wait to see what you spin up!! Your wheel looks great!! I know you will enjoy it..You are really involved now!! 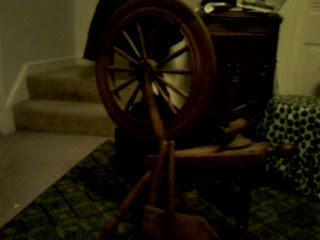 If your spinning is as awesome as your dying..you've got quite a future with your fiber!! And I have no doubt it will be. HUGS..
Great wheel! You're going to have sooooo much fun with it, I'm sure. A shawl KAL? You're the energizer bunny of knitting!